I just love sweet potatoes, any type... this is a twist on the classic twice-baked potatoes. To make it even more interesting, I think I will try making this with Okinawan sweet potatoes (the purple type). 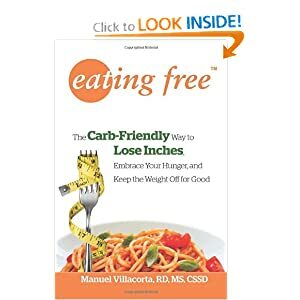 Order Eating Free - The Carb Friendly Way To Losing Weight - Eating Free reveals why the prevailing wisdom on weight loss--low-calorie, no carbs, high-intensity exercise--sharply clashes with the facts of human biology and human nature, setting dieters up for failure, again and again. He offers a welcome alternative: a scientifically sound, sensible, effective, and truly pleasurable way of eating. Pre-heat oven to 375 degrees. Half and bake the potatoes on a baking pan, cut side up, for about 35 minutes or until the insides are soft. Remove them from the oven, and let them cool down enough to handle. With a spoon, scoop out the meat and place in a bowl, leaving the skin intact. With a fork, gently mash the potato, and add the sour cream, milk, and Parmesan cheese. Season with salt and pepper. Stuff each potato skin with the potato mixture and return to the oven. Bake for 10-12 minutes. Let cool for a few minutes, sprinkle with bacon and chives, and serve.